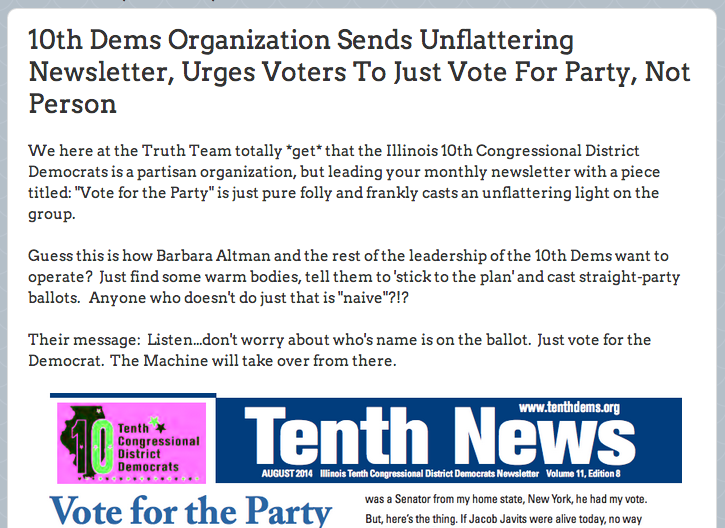 10th Dems Organization: If You *Think* About Who You're Going To Vote For, You're Naive! Reminder to all of you candidates who are aligning with organizations around the State of Illinois: If you stand with the 10th Dems - the Illinois 10th Congressional District Democrats - you're standing with a group who labels people who are considerate and thoughtful in examining what candidates stand for as "naive". We'd ask all candidates who are joining forces with the 10th Dems to reject this thinking and call on the organization to recant their statements that ridicule voters who "carefully examine the qualifications, positions, and—when available—records of competing candidates before deciding which one to support."